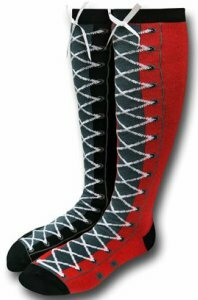 This sock features the black and red colors of DC Comics super villain Harley Quinn, using black on one vertical half and red on the other with a black toe and heal along with a printed on faux lace from the toe to the top of the sock finished with a real bow at the top. To get that amazing warm, soft, comfortable, stretchy and durable sock you need to blend the perfect materials, this sock has that as it is made with the blend of 68% acrylic, 30% polyester and 2% spandex. It is a one size fits most women knee high sock that is great for any occasion. Well.. to be honest I never thought I’d hear the words cute, and Batman, uttered in the same sentence. But you have to look at these adorable socks! Kawaii! So dang cute.. aqua colored with grey stripes, the Kawaii style smile on the top, and classic Batman trademark Bat Logo near the toes! It juxtaposes feminine and comic fan and hit’s the note perfectly! You will have just the right level of snug and stretch with 68% acrylic, 30% polyester and 2% spandex blend. Fun fashion! Highly rated by those who’ve tried ’em! Bat-Happy Feet? You bet! Get a pair or two for yourself, or your BMFF!! 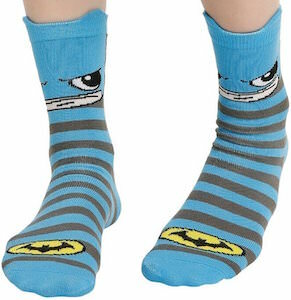 Grab onto a pair of Kawaii Batman Socks. Happy feet! Is it complete madness?? When we put on a cute pair of lady supervillain comic themed ankle socks, we immediately feel transformed! Don’t ask me how it works, it just does, and scientist’s be damned, its a non-linear metric that is impossible to prove ok.. But awesome socks make life fun! Harley Quinn is the queen of cool (true, while being a wicked badass madwoman!!) , and her kawaii color scheme (red on black) and trademark design, look amazing on this little pair of socks. Acrylic/poly/spandex blend keeps them stretchy and comfortably snug. Why don’t you get a pair or two of these cute high energy socks! Call me nuts, but you deserve a little bit of happiness, starting with the tips of your toes! This will click with your style! 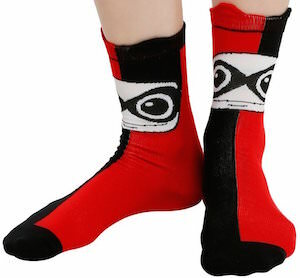 Grab your stylish Harley Quinn Ankle Socks. The Joker is always on the case of Batman, this is one DC Comics villain that rivals Batman. On these socks you will see the DC Comics villain Joker, a cartoon head image is at the top of the sock in white and green with a grey sock that has black pin stripes. Also the cuff trim, heel and toe are all green giving this a classic Joker look. To make these socks durable, comfortable and fitted a blend of three material is used 68% acrylic, 30% polyester, 2% spandex, they are available in a one size fits most and with the stretch many different sizes of feet will fit. Have a look at the DC Comics The Joker Striped Ankle Socks. These women’s socks are yellow and have a black cape. And who wears a black cape? Yes Batman does. So besides being yellow these socks also have the Batman logo and a whole bunch of little black hearts because we all love Batman. These Batman socks are one size fits most and are just great fun to wear and by wearing them you can feel a bit more like the Dark Knight himself. And these socks are pretty high so that they also keeps you legs and feet nice and warm while looking amazing. 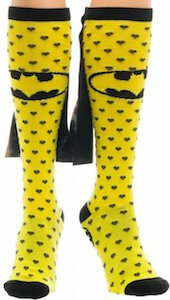 Come take a closer look at these fun Yellow Caped Batman Logo Socks. Are you a DC Comics Batman fan? 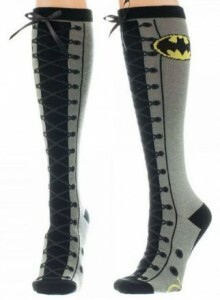 Maybe you are Batgirl, well here is the perfect pair of knee high socks for you. These Batman socks features the classic colors of Batman grey and black with calf high prints of the yellow bat symbol, there is a full lace up print that leads to a black satin ribbon tied in a bow making the knee high socks really look like they are a full lace. An officially licensed DC Comics product that is made to be both durable and comfortable using the perfect blend of 68% acrylic, 30% polyester and 2% spandex and is available as a one size fits most. Get into the DC Comics Batman Faux Lace Up Knee High Socks. Batman gets cold feet too and which socks do you think he chooses when they do? Well of course he is going to have some sock with his own logo on them. The famous Batman Logo is featured front and center on these socks. Across the toes it says “Dark Knight” and they have a winged look on the back. They are black and yellow, the colors of the man himself. The socks will fit Men’s shoe sizes 6 to 12 and will keep your toes and your Batman love warm and toasty. You better be supporting your favorite masked man with the Batman Logo Athletic Socks. If you are a fan of the awesome DC Comics superhero Batman you will want to take a close look at this amazing pair of socks. These Batman socks are all black and have yellow toes and yellow heels, the top of the socks have the bat symbol and the really cool feature is the yellow cape that streams down the back giving this a sock worthy for Batman himself. These officially licensed DC Comics Batman socks are going to be warm and comfy giving you a perfect sock for many occasion, and are a one size fits most men and women. 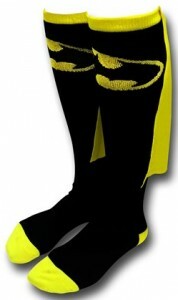 Be a superhero yourself with these DC Comics Batman Symbol Caped Socks. Yes you can go for tiny socks but why would you if you could have some amazing Batman socks like these. These socks are long they go all the way over the knee and that makes them perfect for wearing on a cooler day with shorts or a skirt. And these are not just some grey socks. No these are true Batman socks. The upper part of the socks look like Batman’s costume complete with logo and utility belt and there is more, on the back these socks have a cape to just to add a little bit more fun to these already amazing socks. 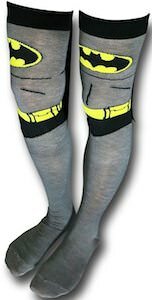 Now you can become a bit more like a real superhero just by wearing these Batman Over The Knee Socks With Cape. Of course your baby is like a superhero already. And if it likes Batman then this set would be perfect. This Batman set has a fun bib that makes your infant look like Batman complete with Batman logo and tool belt printed on the bib and then like a good superhero there is a cape that you can attach with velcro making the bib almost like a baby Batman costume. And lets keep those feet warm to with the included Batman booties. The booties are black and have the Batman logo on it of course and they even have the name “Batman” on the cuff. 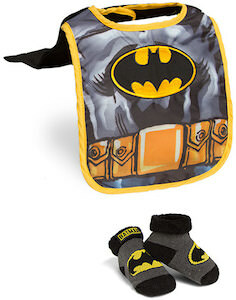 Adults and kids can now enjoy a clean baby with this Batman Bib And Booties Set.